Obama's approval rating high, but will it last? WASHINGTON (CNN) -- Nearly two out of three Americans approve of the job Barack Obama is doing as president, according to an average of the most recent national polls. President Obama is still being evaluated on how he does his job, CNN's polling director says. In a CNN Poll of Polls compiled Thursday, 64 percent of those questioned in various surveys say they approve of how Obama is handling his duties as president. Twenty-eight percent disapprove. The president's approval rating also stood at 64 percent in a CNN Poll of Polls compiled in January, just after his inauguration. 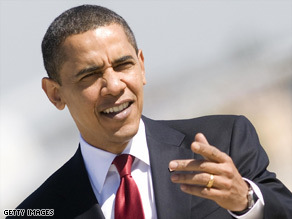 "Most polls have shown Obama getting fairly high marks on most of the issues he has handled so far," CNN Polling Director Keating Holland said. "One exception has been the way he has handled government assistance to failing banks and automakers. His numbers on the federal deficit are also low in comparison to his approval ratings on the economy and foreign policy." So how does Obama compare to his predecessors in the White House around the 100-day mark? You elected them, now grade them with CNN! Rate the president, Congress and your state leaders. "The hundred-day mark tends to fall during a period when Americans are still evaluating a new president. The danger period for most presidents comes later in their first year in office," Holland explained. "Bill Clinton, for example, still had good marks after his first 100 days, but his approval rating had tanked by June of 1993. Ronald Reagan's approval rating stayed over 50 percent until November of his first year in office, but once it slipped below that mark, it stayed under 50 percent for two years. So Obama's current rating certainly does not indicate that he is out of the woods yet." The CNN Poll of Polls is an average of three national surveys taken over the past week: Gallup Tracking, Pew and AP/GfK.